ONE: Chop and melt 3 ounces of White Melt and Pour Soap in the microwave using 5-7 second bursts. Be very careful when melting small amounts of melt and pour, as it is very easy to burn. TWO: Once the soap is fully melted, use scissors to cut off a very tip of the Injector Tool. You want the opening to be slightly larger, but still small and precise. Lightly spray the mold with 99% isopropyl alcohol. Spraying the mold before filling in the details helps the soap to spread into the details easily. Then, fill the Injector Tool with the melted white soap and carefully fill in the details in each mold. THREE: Filling in the details can take a little patience and a steady hand. If the soap leaks out of the details, allow it to dry and harden, and use the Clean Up Tool to clean up any mistakes. TIP: Have a cup of very hot water nearby when using the Injector Tool. The soap can cool and harden within the tool, which will clog it. 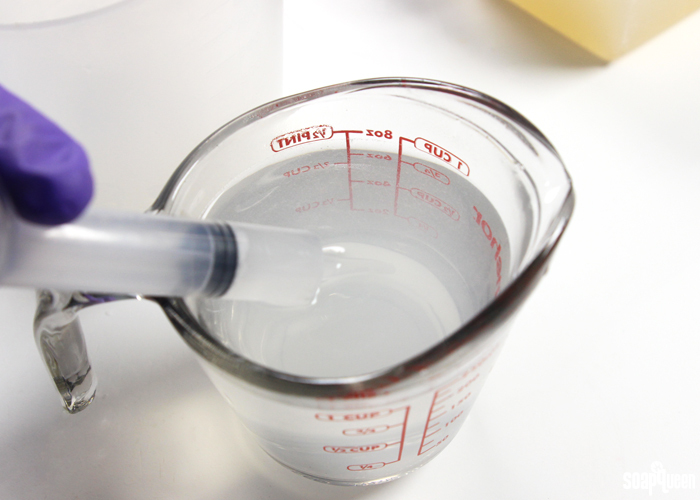 Immediately after using the Injector Tool, clear out the tool in the hot water. FOUR: Chop and melt 7 ounces of the Honey Melt and Pour soap in the microwave using 15 second bursts. 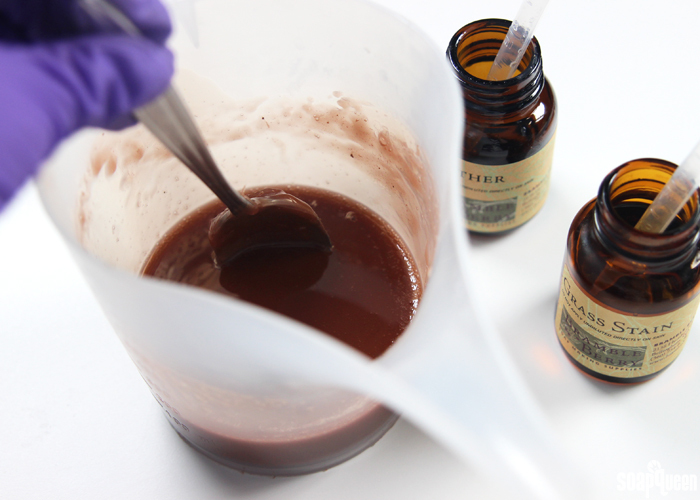 Once melted, add shavings of the Brown Oxide Color Block and stir until you achieve a rich brown color. Then, add 3 mL of the Leather Fragrance Oil and 3 mL of the Grass Stain Fragrance Oil and use a spoon to thoroughly mix. FIVE: Allow the brown soap to reach a temperature of 125 ° F or below. If the soap is too hot when poured, it will melt the white details. 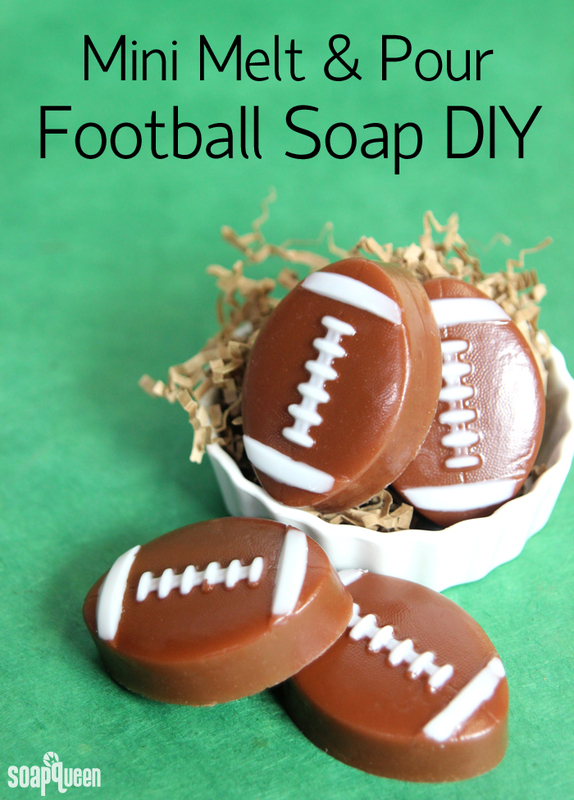 Once the soap has cooled, spray the mold with 99% isopropyl alcohol to help the layers stick. Pour the melted brown soap into each cavity and spritz the top with alcohol to help disperse any bubbles. Allow the soap to fully cool and harden in the mold. To remove, press the back of each cavity with your palm to release the air lock. Enjoy! Wrap the soap in plastic wrap before use to help prevent glycerin dew. Learn more about glycerin dew and how to prevent it here. 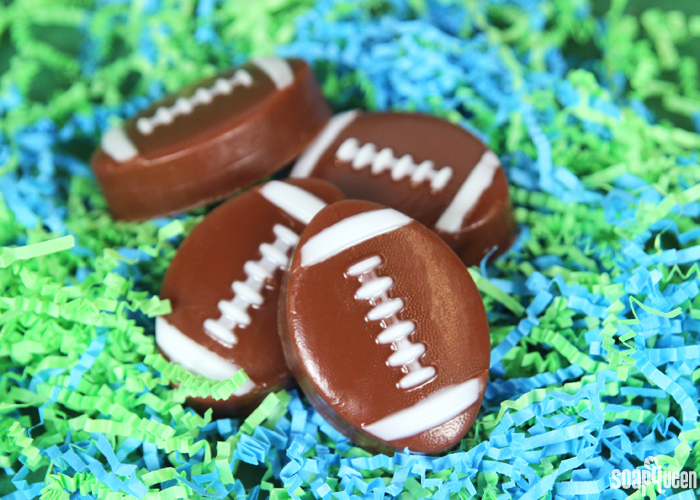 Who will you be cheering for this coming weekend? 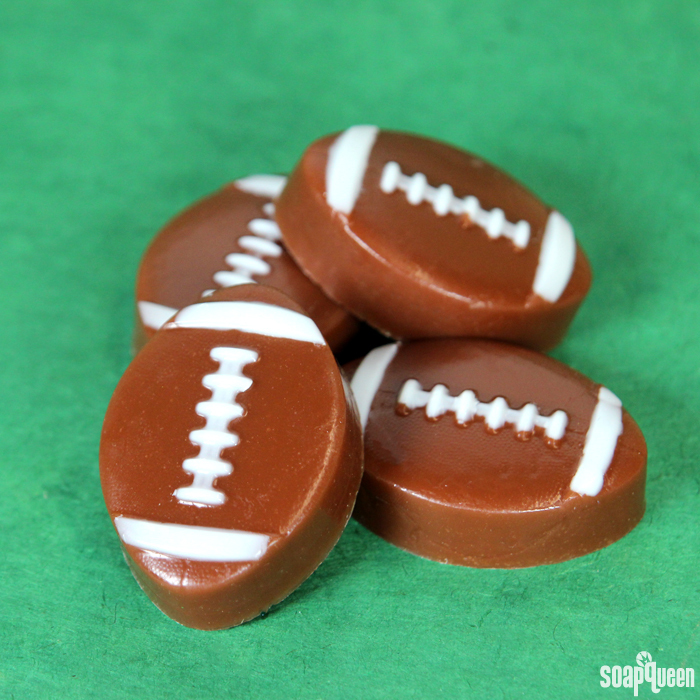 These cute mini football soaps are a great way to celebrate your favorite sport! Chop and melt 3 ounces of White Melt and Pour Soap in the microwave using 5-7 second bursts. Be very careful when melting small amounts of melt and pour, as it is very easy to burn. Once the soap is fully melted, use scissors to cut off a very tip of the Injector Tool. You want the opening to be slightly larger, but still small and precise. Lightly spray the mold with 99% isopropyl alcohol. Spraying the mold before filling in the details helps the soap to spread into the details easily. Then, fill the Injector Tool with the melted white soap and carefully fill in the details in each mold. Filling in the details can take a little patience, and a steady hand. If the soap leaks out of the details, allow it to dry and harden, and use the Clean Up Tool to clean up any mistakes. Chop and melt 7 ounces of the Honey Melt and Pour soap in the microwave using 15 second bursts. Once melted, add shavings of the Brown Oxide Color Block until you achieve a rich brown color. Then, add 3 mL of the Leather Fragrance Oil and 3 mL of the Grass Stain Fragrance Oil and use a spoon to thoroughly mix. Allow the brown soap to reach a temperature of 125 ° F or below. If the soap is too hot when poured, it will melt the white details. Once the soap has cooled, spray the mold with 99% isopropyl alcohol to help the layers stick. 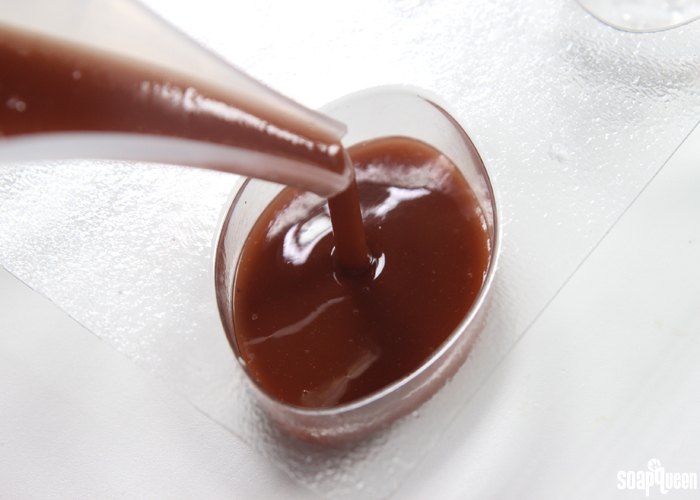 Pour the melted brown soap into each cavity and spritz the top with alcohol to help disperse any bubbles. Allow the soap to fully cool and harden in the mold. 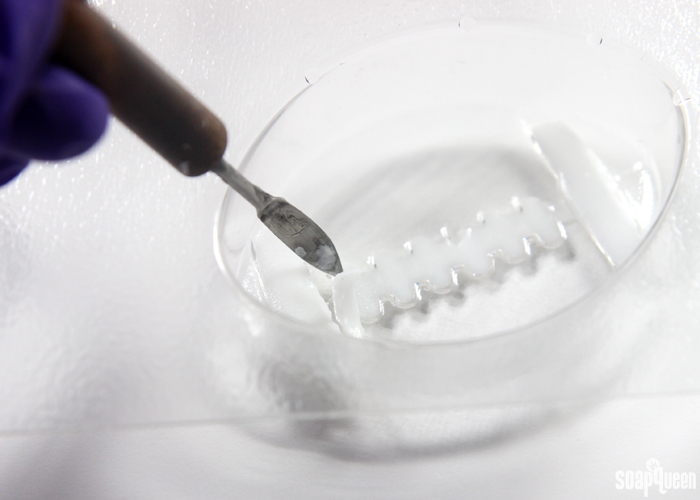 To remove, press the back of each cavity with your palm to release the air lock. Enjoy! Wrap the soap in plastic wrap before use to help prevent glycerin dew. Can you do a tutorial on the Stephenson Suspending Body Wash some time? Some ways we can get creative with it?